Ongoing updates: More US transit agencies that offer free monthly-or-longer passes for riders experiencing homelessness have been added to the post since publication. More will be added as they are found. 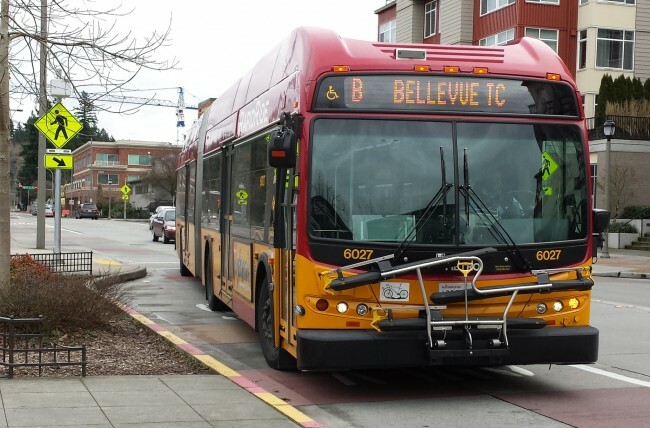 RapidRide B to Bellevue. Photo by Kris Leisten. On Wednesday, King County Metro General Manager Rob Gannon announced some changes to its fare enforcement practices, as a result of an audit. Transit should establish a performance management system for fare enforcement, including establishing baselines, setting targets, and developing measures for outputs and outcomes. Transit should conduct a rigorous fare evasion study to understand the level of fare evasion on RapidRide at least every two years. Transit should review its fare enforcement model for alignment with county and agency goals and equity principles (emphasis added) and use the results to update its model and the fare enforcement contract. Transit should work with the fare enforcement team to develop and implement a system for gathering data necessary to monitor for the equity impacts of fare enforcement. Transit should prioritize implementation of its stalled technology project to ensure that fare enforcement is conducted in the most efficient manner possible. While Metro gives each rider a warning the first time they are caught not paying on RapidRide, that warning never “falls off”, the way it does after one year on Sound Transit. Youth riders get two warnings before a citation is given the third time the rider is caught. This has the side effect of providing better proportionality between the fare and the $124 citation that is set by the state. But, again, the warnings don’t “fall off”. Per the announcement by Gannon, Metro just started giving the second warning for youth riders. Per Gutierrez, Metro is also reviewing the policy of not having warnings fall off a passenger’s record. A combination of more warnings, having them fall off after a shorter period of time than for regular full-fare payers, and having the fine be higher for full-fare payers than the minimum allowed by the state, could be key to solving the proportionality gap between the discount fares and the huge fine. The trick is to come up with a formula that will make a typical frequent rider end up losing the bet if he decides to never pay and just pay citations when he is caught. However, higher fines mean transit agencies have to spend less on fare enforcement to achieve the same deterrent effect — a point that was, unfortunately, not brought out in the audit. A chunk of Metro riders have no money to pay fare, and are at the mercy of availability of free tickets from human service agencies. This is the demographic most clearly negatively impacted by fare collection and enforcement policies. Riders experiencing homelessness get 11% of the warnings, 24% of the citations, and 31% of the misdemeanors for riding while having unpaid citations. Only 3% of citations get paid, costing Metro $340,000 a year in court costs that aren’t covered by uncollectible citations. When fines go unpaid, they go into collections, which can then impact a person’s ability to obtain housing. Some continue to call for the elimination of fares altogether. Fare collection comes with huge costs, in administration of the ORCA program, cash handling, and lots of dwell time added to routes due to collecting fares at the front door. The dwell-time problem creates a vicious cycle of discouraging ridership due to longer bus trip time. The failure to point out that Metro doesn’t use net fare recovery instead of gross fare recovery as an important metric was probably the most major miss in the audit. Since no reliable replacement revenue source (including enough to handle increased service demand if public transit were to be free) has been offered to make elimination of fares feasible, the most obvious measure to deal with the audit’s call for giving those experiencing homelessness a break is to provide free passes that last much longer than one day. Santa Clara County’s (CA) Valley Transportation Authority has the United Pass for Life Improvement Through Transportation (UPLIFT) program. Capital Metro (Austin, TX) has the Transit Empowerment Fund. Valley Transit (Phoenix, AZ) has the Homeless Service Provider Program. Miami / Dade County has the Transportation Disadvantaged Program. Gainesville (FL) also offers free monthly bus passes through homeless services providers. Charlotte (NC) also has a program via discounts to human service agencies. The Fort Worth Transportation Authority (TX) had the Fare Aid program, which was discontinued in 2015. Los Angeles Metro may soon provide pre-loaded Transit Access Passes to riders experiencing homelessness and victims of domestic abuse. Sadly, these programs are far outnumbered by cities that offer those experiencing homelessness free one-way tickets out of town. Correction to previous post and previous correction: In a previous post, I asserted, partially incorrectly, that Sound Transit collects a fare when a passenger taps on for a train ride, but then changes her/his mind and catches a bus, but forgets to cancel the train ride tap. Sound Transit spokesperson Bruce Gray offered a partially-correct correction. If a card is tapped a second time [for a Link or Sounder ride, and then for a bus ride] within a 5 minute window [at the same station], the transaction gets reversed and the tap is cancelled (fare charge is reversed). Beyond that, Sound Transit gets at least some revenue for a trip, rather taken or not. Regardless, full monthly passholders get charged for a full pass each month, and the revenue apportionment among the agencies is invisible to the passholder. We just, on rare occasions when we mess up taps, can get incorrectly — and publicly — accused of “fare evasion” by the fare enforcement officers (and that has, thankfully, only happened to me once), and be subject to a $124 citation if we mess up again within one year, making frequent riders think twice about continuing to buy monthly passes or ride the train. It still isn’t clear how wrongful public shamings and citations helps Sound Transit improve fare revenue better than gentle reminders to please remember to tap, and collecting data about how often it happens, so that a statistical extrapolation can apportion fare revenue more accurately, without costing the good will of Sound Transit’s most frequent riders and ardent advocates. The auditor’s recommendation that someone go along with the Metro fare enforcement team to get a reality check at least every two years should apply equally to Sound Transit’s fare enforcement team. They don’t really have the independence to question whether their orders make sense. But when an auditor sees someone who simply mis-tapped get accused of — or fined for — “fare evasion”, that should set off a red light that Sound Transit is doing something terribly wrong, both for the innocent rider who made her/his best-faith effort to pay, and has successfully done so many times, and for Sound Transit, who could lose a customer for no good reason. Speaking to point 5 in the Metro audit, wasting time on people who did not actually evade fare payment is also an inefficient use of the FEO’s time. While an FEO is giving the wrongfully-accused rider the speech, a real fare evader — who knows to sit in the mid-section of the vehicle — is slipping out the door. One could write the problem off by othering the victims as “techbros”. However, with all Seattle Public Schools high school students getting a year-round full pass, high school students are going to start being caught in the net, and subjected to public humiliation and possible $124 citations, even though they thought they had a pass that pays for all transit trips on nearly every public transit service except Washington State Ferries, Kitsap fast ferries, Amtrak, and the monorail. If the County starts giving out free monthly passes to the homeless, then some of them, too, will get caught in this net. For proof of payment systems to work there has to an efficient enforcement process. That can be executed cost-effectively. Where the probability of being caught and fined is high enough and the penalty high enough to dissuade fare evasion. That necessarily means relatively high penalties. And it requires that the court system isn’t too expensive, too. It doesn’t really sound like we have any of that in place. If only 3% of citations are being paid, why are we bothering with citations at all? Or even with fare enforcement – then in principle most fare evaders have no penalty at all and fare enforcement is only aimed at the wealthy or responsible. If it’s creating problems for homeless and they shouldn’t be cited, it would make more sense for a FEO to give that person an ORCA card with an annual pass on it so that future FEOs don’t waste time and resources. Or stop just charging fares on these routes, and save the cost of fare enforcement. There don’t seem to any real solutions being proposed. Either be serious about collecting fares (and fines) or don’t bother with the charade. And Metro and ST need to stop citing anyone with a valid pass, whether daily, monthly, or annual, if they fail to tap. If they have a valid pass, that’s good enough, and the agencies can use an estimate to allocate revenue. It is ridiculous both to punish these people, even with a warning, and it is also a waste of fare enforcement resources. I’m good about tapping my ORCA but even I have forgotten. That doesn’t mean I should penalized when I have a valid pass. In Metro’s defense, they have lower “fare evasion” rates than Sound Transit. I don’t think the full difference comes from wrongful warnings and citations on Link/Sounder. I think the audit team way overstates the case for Metro’s lack of having a handle on statistics. The audit team claims that having more fare enforcement on the (demographically poorer ridership) A and E lines skews the statistic on fare evasion rates. I don’t buy that. It means more citations are given on those lines, but not that Metro is getting its division and multiplication wrong. I’m also not for de-policing the A and E lines, as that is where a security presence is more needed. As the report points out, FEOs do “safety rides” which don’t involve checking fares. Metro brings in ca. $125 million a year in fare revenue. Fare enforcement costs somewhere under $2 million (but more than the $1.7 million the audit team stated, as the Executive pointed out in his response). The lack of a stated definition of fare enforcement effectiveness does not mean fare enforcement is ineffective. Is fare enforcement worth it? Heck yeah! IMHO. But it does seem Metro is drawing the wrong conclusions from the audit. The problem is not with fare enforcement officers, or their training. I think they are doing an outstanding job, and being thrown under the bus because they are being asked to carry out conflicting orders. To paraphrase Sun Tzu, if the orders are not clear, it is the fault of the general. If you read through the full audit report, there are obvious contradictions within the audit team’s narrative and recommendations. I thought the audit report was fine and disagree with your conclusion. Implicit bias in fare enforcement is important, as we know that jaywalking citations are often given in poorer and darker communities because the cops feel that it’s like shooting fish in a barrel. Unfortunately that also contributes to mistrust amongst law enforcement in those communities. There is no “baseline” calculation of fare evasion, only the non-random checks made on RR, so the numbers are going to be skewed. One could argue that anti-jaywalking laws should not be enforced. Counting pedestrians and crossings is tough. If Metro is not separating the data by route, the audit team has a point. If the audit team is merely pointing out that fare checking is not accurate on the bus rides they sampled, then that has less to do with policy and more to do with methodology. (e.g. Have someone at every door, so nobody can sneak off.) Either way, the reasons why Metro’s fare evasion rate would be lower than Sound Transit’s is fairly obvious, and the reasons why it is lower than some of the peer agencies the audit team contacted should also be obvious. The other agencies don’t have the robust Business Passport program Metro does, nor the huge number of free tickets for human service agencies, nor the ORCA LIFT low-income fare program, nor the passes for high school students (since schools generally don’t push transportation off on local transit agencies). Metro’s calculations may be slightly off, but not by an order of magnitude, or nonexistent. Metro doesn’t have the tone confusion that Link/Sounder do. Metro accepts paper transfers, including ones falling apart from years of re-use. (I bet the audit team noticed, and thought better of pointing that out.) ST has lots of passengers who try to use those paper transfers as proof of payment on ST services, some with the best of intentions. Metro’s paper transfers are inflating each partner agencies’ fare evasion rate. But I digress. Maybe the audit is one really long way of asking “What is Metro actually trying to achieve with fare enforcement?” If the goal is to maximize gross fare revenue, I think they are doing fine. Net fare revenue is another matter, with solutions that human service agencies so far haven’t embraced. I’m also under no illusion that having a homeless monthly pass program will save Metro money, much less the $100K in annual court costs trying to collect from non-payers experiencing homelessness. That $100K the audit team tries so hard to paint as important is a rounding error in Metro’s budget. 1. Yes, it is good to have an occasional reality check. 2. Yes, it is good to check out recommendations of national transit consortiums, but keep in mind that they get their best ideas from agencies like Metro and Sound Transit, while being filled with heads of other agencies that are further away from the cutting-edge of best practices. 3. No, a much small sample size does not produce better data. Also, by “baseline”, the audit team means a goal, e.g. “Hold fare evasion under 4%.” Fine, Metro can set a high baseline that it knows it is already meeting… because it produces better data than what it will have if it follows the all the audit recommendations. Why are only 3% of citations paid? Are they citing the wrong people (homeless, indigent) who maybe should be referred to social services instead? Or are they citations being thrown out in court or just not enforced? What would stop someone from giving a fake name? You’re not legally required to carry ID with you at all times. Seems like it would be very easy to give FEOs a wrong name and toss your ticket in the nearest bin upon exiting the bus. We obviously need fare enforcement since we have all door boarding and no turnstyles. Every form of collection has its downsides. Overall, this is more efficient than turnstyles or making the driver do fate enforcement. Frankly, I’m glad the homeless can’t ride the bus for free, since many would probably just camp out in the buses during the winter. This already happens to some extent. There are already enough crazies on some bus. It will just drive down rirdership for paying customers and make the bus an unsafe place for most people. Do you mean people of minimal means through no fault of their own- like being both ill and 70 years old, or being evicted from their lifelong home, which the lender then leaves empty to rot into a neighborhood blight and a drug den? Or for same reason having to shave, or your wife put on lipstick in their rearview mirror before going to their supervisory job? Will go along with you far as these two examples. If the US Government had not given their lenders lifelong passes out of jail, and also a free rebuild of the system they ruined, there’s be enough well-paid work repairing our country that everyone can pay for their own bus ride. And what’s exactly is “a” Crazy? If you mean someone mentally ill, most are silent and withdrawn. Alcoholic? Lord, if there ever was a drug that should be illegal for Eternity! Correction officers tell me average assault wouldn’t happen if both parties were sober. Good punch breaks a lot of amateur knuckles. So you are absolutely right that if the State of Washington can just get mental health facilities that are not 90% in the criminal justice system, riding transit will vastly improve all around. So me to you, since you’re interested in general improvements in society and transit, two experiences you definitely need. One, join whatever lobbying group suits you, and make your legislators run their State someplace besides down a tectonic fault. And two, take a year off and find a tarp and a plot of land under a freeway. While of course working at your present job. And if the system chooses to offend paying passengers by giving you a pass, be sure to tap it wrong twice same year. And Brent, be sure to save Brendan some space for a posting. Really looking forward to it. Many thanks to you both. I’m sorry about the ad hominum flag. I have been homeless in the past, and the fact is there is a shortage of shelter beds in Seattle. The people who try to stay warm on the owls, often don’t have any other choice. I’ve pondered if the city should just pay metro to pull out a few busses at night and station them at a few spots for the purpose of providing a warm place. It’d help return the night owl busses to their intended purpose of providing transportation, while providing a better spot to sleep than a moving bus. I haven’t personally seen the inside of the shelter system, but I’ve had a friend who used it for a year. Its significantly less than ideal from what I’ve been able to puzzle out. A better solution, long-term, would be to ditch our snob zoning and other stupid laws designed to artificially keep down the housing supply. In the meantime, neighborhoods that have fought density should do their part by allowing their local places of worship to host as many people as they care to host, if they don’t want them sleeping on sidewalks, in the parks, on buses, etc. Homelessness is a not a behavior. It is the difference between humanity and available housing. Nice thought, Nick, but wrong equipment. What about sanitation of any kind? Every one of these buses would need a major-clean that’d take it out of service for at least another day. And think about it: except for the aisles and the bench seat across the back, nowhere to lie down. Better path for the authorities to investigate: talk to the National Guard about everything from trailers to tents. Or the Red Cross. Some agency should have emergency shelters ready in case of a natural disaster. Or knowledge of how to build them fast, from scratch. Have been serious about classing present shelter situation as an earthquake drill. Keeping in mind that re-connection with the rest of the country could be problem with so many highways collapsed. Call your reps. If you live in Seattle – call Rob Johnson because it’s about Transportation Choices. And of course, Mayor Durkan. Matter of fact, get some other people and start showing up at City Council meetings. They seem to be puzzled about what to do. Maybe the Army can straighten them out. I see a lot of clarity on the city council, except for the obfuscation from my district councilmember. Build more housing, as densely as possible. Require a lot of it to be affordable, but not so much that it causes the housing not to be built. Don’t build more automobile parking than necessary. What’s to puzzle over about that? You’ll need a lot of subsidized housing too. Market rate alone is not sufficient when 1BR rents have gone from $700 to $1700 in the past fifteen years, and sub-$1000 rents are practically unheard of now, and won’t come back even with liberalized zoning, except maybe in a depression. I get it that we need a lot of subsidized housing. But there are those who seem to think the only new housing should be done by non-profits, and everyone else should be blocked from building anything new. Non-profits have a big part to play, but the size of the crisis is far beyond what non-profits can deal with alone. I ride buses between downtown and LQA during the day and I now strongly prefer any route other than Rapid Ride (i.e. I prefer any route where you have to pay at the door) because the crowd is distinctly sketchier on RR. I’ve never once seen any fare enforcement on RR. Are you talking about the D or E Line? The E’s predecessors have always been sketchy. The D I would not expect, and I have not found it such. The sketchy routes have always been whatever serves Aurora or Rainier Beach, regardless of fare style. And honest, Brendan, missing last letter just typing error. Only Brenda I’ve ever encountered was fifty years ago when she was a red-haired reporter in the comics in Chicago. Recall she wore a veil, as did most professional women. And any racist nut-case who tore it off, they’d still be cleaning out of the undercarriage of a 1953 PCC subway car. But now, as Monty Python’s John Cleese would often say when finished speaking with an English army officer or policeman wearing a ballet tutu..for something completely different! Like three brief easy and non-negotiable changes in fare collection. 1. Make every pre-paid ORCA pass blanket immunity from Fare Evasion prosecution, instead of possible State’s Evidence. Making tapping itself conditional on a sincere “Please” and “Thank you” from the system. 2. Immediately cease and desist punishing passengers for anything at all regarding interactions between the separate agencies providing service to Sound Transit. 3. Except for willful theft of service, keep every fare-related matter in-house, rather than in-District Court. Maximum penalty: turn off an offender’s pass. Or charge a fine for the next one. One immediate benefit to transit: any financial penalty will compensate transit itself. Instead of all going to the Court system. Point 1- should take one phone call from CEO to Security. Other two- complete moratorium on penalties until paperwork is done. And clarification: Does the Legislature mandate $124 penalty- or just give the system permission to impose that amount because District Court won’t handle the cases for any less? So right now, I need some information and advice as to my first step in taking this publicly political. Since my voting address is across the Nisqually from voting- have I got any politician that could be interested besides my neighbors Steve O’ban and Bob Hasegawa? And what organizations? Unless I’m missing something I, can’t find any interest from Transit Choices Coalition, Transit Riders’ Union, or any other sector. One serious encouragement, though. Conversations with ordinary people including every Fare Inspector I’ve spoken with lately tell me that the general public is with me on this one. Would appreciate any thoughts in today’s Comments. Request, Brent. Bracket supply dwindling, so save them. From this audience, [AH] nowhere near a [TKO]. Remember what route I drove. State law does not mandate a fine. It sets the minimum and maximum fine. Check out Revised Code of Washington Title 7 Chapter 7.80. Nor does ST Board policy require the dishonoring of passes. I can’t find it anywhere. Rather, staff has filled in the definition of “proof of payment” when none was provided in R2009-02. Of course, how can you not consider a valid pass “proof of payment”? Before bothering the lege, which is only interested in ammunition to defund Sound Transit, maybe you can get the attention of Sound Transit’s new Director of the Passenger Experience. He must realize this staff-created policy makes ST look like dirty double-something Nazi-zocialist Mafioso banditos (or thieves, if you don’t have the Tsimerman Babel-Fish handy). BTW, although a regional day pass is pre-paid, it is not activated until the first tap. Failing to activate it before riding doesn’t make it valid, so it shouldn’t protect from the warning and citation. Once activated, you should be good to go for the day, regardless of mis-taps. Glad to do it. Kind of liked tapping both on and off. And guarantee it wouldn’t take much of a campaign to get kids to make their parents do it. Have seen three year olds stretching up to the screen to tap their mom’s card. But just for principle’ sake- why issue any punishment at all to anybody that’s got a pass? Railroad conductors accepted paper tickets since there were trains. Don’t like being threatened and bullied, period. I’m not sure what’s going on here, which gets to me the most. I’ve worked on good terms with some of these people for over thirty years. They’re better than this. My own guess is that they’ve gotten themselves into an inter-agency falling-out that they really think could help their legislative enemies wreck Sound Transit itself. As I’ve told them twice in public comment at Board meetings, any thing I’ve learned about the system all these years is theirs for the asking. If they need $124 for any of a wide variety of things I know they need, District Court is off the hook. But Rule One in passenger transportation: You don’t do anything that will routinely and deliberately hurt a single passenger. Otherwise, you don’t deserve even that many. Now about Alex Tsimerman. The two of us are pretty much same extraction, and he’s five years younger than me. Meaning that like for many Russians his age, the only world he ever really knew is gone. Russia really is ruled by a billionaire mafia that’d make the Godfather look like an altarboy. Though doubt they’d waste a drop of poison on him. Accurate observation: Capitalism did in ten years what the Communists could never do in seventy: Make Communism look good. Communist officials were gangsters too. But they at least pretended they cared about the average person. No longer in the business plan. Might be good to get with the Israeli consulate. Not sure about younger generation there, but it’s the one place left on Earth I think he’d ever be be at home. Meantime- very direct experience. City Council meeting, I stood up, looked him in the eye, and told him I didn’t like anybody insulting my elected officials. Worked. So especially for Sound Transit, but every other similar meeting too, try to find people his age and mine in some department to get up and do the same. Wish I’d stayed with my Russian and learned Yiddish, but recognize me right after him and see what I can do. Let the Deputy go deal with arrogant pass-possessing fare evaders.